† Study 306: 12 week, randomized, multicenter, double-blind, double-dummy, active-controlled, non-inferiority (NI) study. NI was met if the lower bound of the 95% Cl for the mean treatment difference was greater than -6% for the mean percent change in LDL-C.
* Pitavastatin was not studied against Pravastatin 80 mg.
† Study 301: 12 week, randomized, multicenter, double-blind, double-dummy, active-controlled, non-inferiority (NI) study. NI was met if the lower bound of the 95% Cl for the mean treatment difference was greater than -6% for the mean percent change in LDL-C.
* Pitavastatin was not studied against Atorvastatin 40 mg and 80 mg doses. † Study 302: 12 week, randomized, multicenter, double-blind, double-dummy, active-controlled, non-inferiority (NI) study. 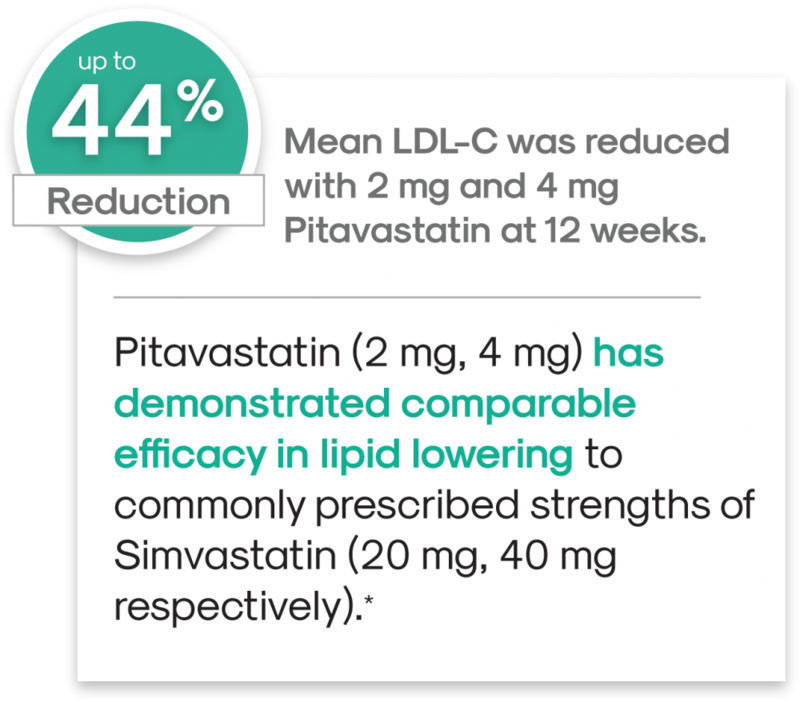 NI was met if the lower bound of the 95% Cl for the mean treatment difference was greater than -6% for the mean percent change in LDL-C.
* Pitavastatin was not studied against Simvastatin 80 mg.
1) Zypitamag™ [prescribing information]. Ahmedabad, India: Cadila Healthcare Ltd; March 2018. 2) Stender S, Budinski D, Gosho M, Hounslow N. Pitavastatin shows greater lipid-lowering efficacy over 12 weeks than pravastatin in elderly patients with primary hypercholesterolaemia or combined (mixed) dyslipidaemia. Eur J Prev Cardiol. 2013;20(1):40-53. 3) Budinski DF, Arneson V, Hounslow N, Gratsiansky N. Pitavastatin compared with atorvastatin in primary hypercholesterolemia or combined dyslipidemia. Clin Lipidol. 2009;4(3):291-302. 4) Ose L, Budinski D, Hounslow N, Arneson V. Comparison of pitavastatin with simvastatin in primary hypercholesterolaemia or combined dyslipidaemia [published correction appears in Curr Med Res Opin. 2010;26(5):1046]. Curr Med Res Opin. 2009;25(11):2755-2764. Primary Hyperlipidemia and Mixed Dyslipidemia: Zypitamag™ is indicated as an adjunctive therapy to diet to reduce elevated total cholesterol (TC), low-density lipoprotein cholesterol (LDL-C), apolipoprotein B (Apo B), triglycerides (TG), and to increase high-density lipoprotein cholesterol (HDL-C) in adult patients with primary hyperlipidemia or mixed dyslipidemia. Limitations of Use: Doses of Zypitamag™ greater than 4 mg once daily were associated with an increased risk for severe myopathy in premarketing clinical studies. Do not exceed 4 mg once daily dosing of Zypitamag™. The effect of Zypitamag™ on cardiovascular morbidity and mortality has not been determined. Zypitamag™ has not been studied in Fredrickson Type I, III, and V dyslipidemias. Zypitamag™ is contraindicated in patients with a known hypersensitivity to product components, in patients with active liver disease (which may include unexplained persistent elevations in hepatic transaminase levels), in women who are pregnant or may become pregnant, in nursing mothers or in coadministration with cyclosporine. Advise patients to promptly report unexplained and/or persistent muscle pain, tenderness, or weakness, particularly if accompanied by malaise or fever; discontinue Zypitamag™. Zypitamag™ should be discontinued if markedly elevated creatine kinase levels occur or myopathy is diagnosed or suspected. Zypitamag™ should also be temporarily withheld in any patient with an acute, serious condition suggestive of myopathy or predisposing to the development of renal failure secondary to rhabdomyolysis (e.g., sepsis, hypotension, dehydration, major surgery, trauma, severe metabolic, endocrine, and electrolyte disorders, or uncontrolled seizures). Fatal and non-fatal hepatic failure can occur. Interrupt Zypitamag™ if serious liver injury with clinical symptoms and/or hyperbilirubinemia or jaundice occurs. If an alternate etiology is not found do not restart Zypitamag™. Use Zypitamag™ with caution in patients who consume substantial quantities of alcohol and/or have a history of chronic liver disease. Do not use Zypitamag™ if patient has active liver disease, which may include unexplained persistent transaminase elevations. Increases in HbA1c and fasting serum glucose levels have been reported. Myalgia, back pain, diarrhea, constipation and pain in extremity (rate ≥ 2% in at least one marketed dose). This is not a complete list of all reported adverse events.